Click on the screen shot of the game Four Colours from Pretty Good Solitaire to download the 30 day free trial version. 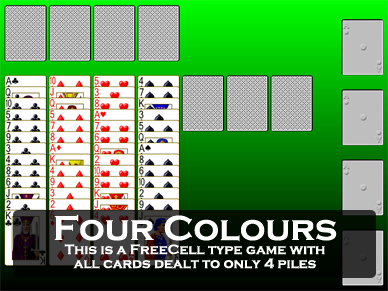 Four Colours is an interesting and unique one deck FreeCell type game. My version of Four Colours in Pretty Good Solitaire or FreeCell Plus allows you to play offline, full screen, with complete undo and my unique right click quick move. It's the best way to play FreeCell! There are four foundation piles (on the right) that are built up in suit from Ace to King as usual. The objective is to move all of the cards here. There are four cells (at the top). 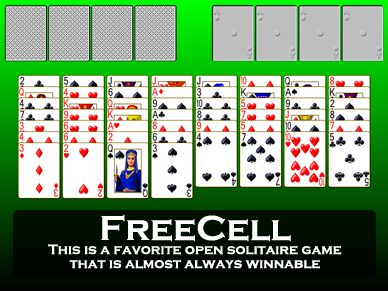 LIke FreeCell, only one card allowed in each cell. However, only one card of each suit is allowed in the fiour cells. First cell holds a Club, 2nd a Diamond, 3rd a Heart, and 4th a Spade. Finally, there are seven tableau piles. These piles are built down by alternate color. You can move groups of cards if they are in sequence down by alternate color. Fill spaces with any card or legal group of cards. At the start of the game 13 cards are dealt to each of the leftmost four piles (all cards of the same suit are dealt to the same pile). The remaining three piles start the game empty. The game starts with all of the cards of the same suit in four piles. You can only move a card of the suit from the pile directly below to a cell, but you can move any card or group of cards in alternate color to the remaining three tableau piles. Four Colours is a fairly easy game to win, an average player wins about 85% of the time.